At our house we love to write, build, draw, and make our names out of basically any material we can find. I even have an entire pinterest board devoted to name activities and crafts. 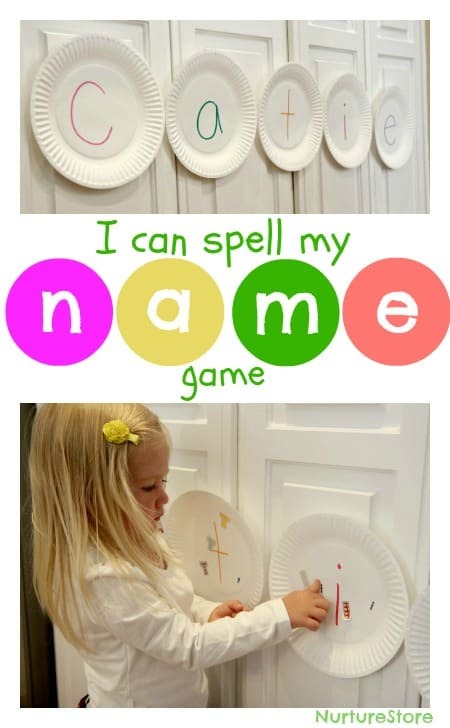 I really enjoy finding simple learning activities that allow kids to play with and explore the letters in their names. 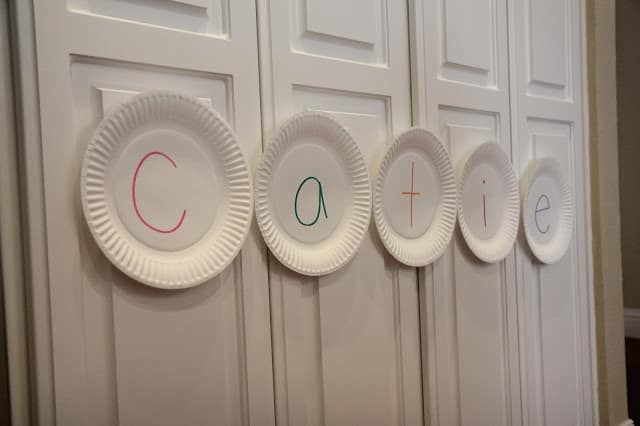 A few weeks ago my daughter and I pulled out some paper plates from our cupboard and created a name activity with stickers. I started off by writing a letter in the center of each paper plate. Then my daughter and I hung the paper plates on our cupboards using painters tape. We hung them in order so that we ended up spelling her name! 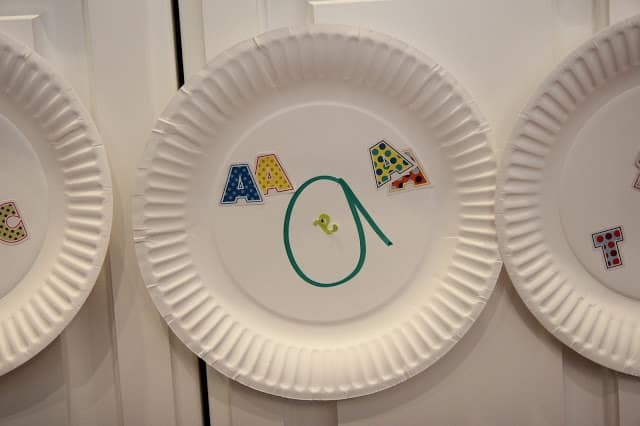 Once the paper plates were hung up, we grabbed our colorful alphabet stickers and talked about how the first paper plate had a big letter C on it. 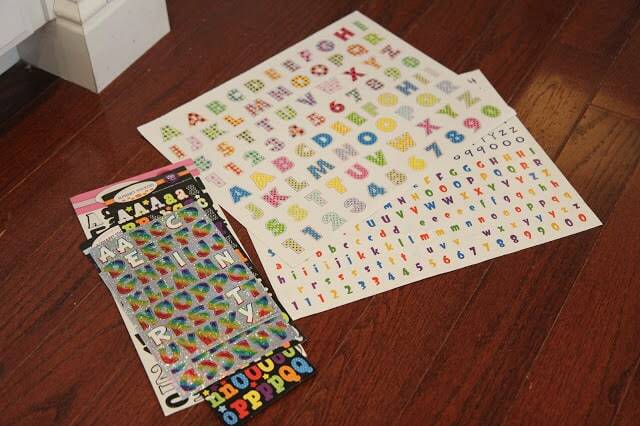 Then my daughter went on a hunt for letter C stickers! 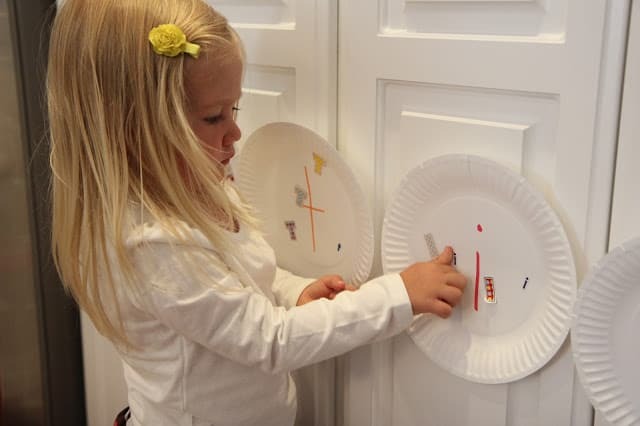 Once she found a letter C sticker, she added it to the paper plate and then hunted again. She added lower and uppercase C! Once she was done hunting for letter C, we moved on and hunted for stickers that matched the next letter in her name. We repeated this until each paper plate had several matching ABC stickers on it. What I love about this activity is that it can take as much time or as little time as you have. We left our paper plate letters up on the wall for several weeks so that we could talk about them and add more and more letters to them. My daughter loved seeing her name on the wall and this activity got her talking about and identifying the letters in her name! Learning the whole alphabet can be overwhelming, but focusing on a few important (and favorite) letters can make the ABCs seem much more friendly and familiar. In what other ways have you helped you child explore and create with her name? It was so fun to guest post this week and share this game with your readers. We LOVED it and hope others enjoy it too. Thanks for letting us share on your site Cathy!